I was thinking of doing a “Things That Are No Longer There” post of subjects that I have photographed over the years that are no longer around, such as old buildings that have been torn down. Instead, after taking this photo, I think I will start with a subject that is still around. I took a similar photo of this glove over 3 years ago (without the snow) and I was driving by the area the other day and noticed it was still in the same spot, in the same position. 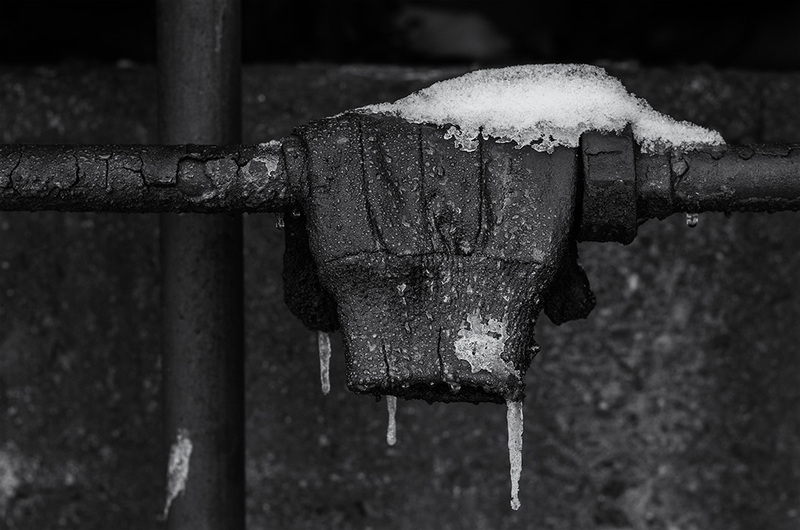 The glove is sitting on some pipes by oil tanks behind a building in town, but it’s out in the open and easily seen by passersby. I don’t think the tanks are being used anymore, which may explain why nobody has tampered with the glove, or anything else in the vicinity for that matter. Considering it has been exposed to the elements all these years, it looks like the oil is working as a good preservative! I try not to repeat myself too often in my photography subjects but it’s often hard to do. I have limited subject matter and limited times to shoot it, so repeats are bound to happen. I may try to improve upon a previous shot if I am able but usually the first time was the charm and my “improvements” end up being a waste of time that I should have used elsewhere on something new. Sometimes you can’t over think things.